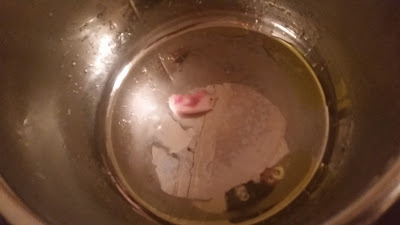 I've had my eye on a recipe using these three ingredients in the compilation of my grandmother's cooking files for a while, but the directions said things like, "cook spareribs in pressure cooker until done". Hmmm. We're just now starting to feel the first fall chill here in Northern California, and I woke up this morning to a post in a FB group about another country ribs recipe that included the timing. Piecing together the pieces of information from those and a couple of other recipes, I made a successful dish! From just a few simple ingredients came a very satisfying dish, perfect for the surprise rainy day we just had here. This is old-school comfort cooked up with the latest technology, my multi-function cooker. I'll admit sauerkraut isn't for everyone. I really only learned to like it as an adult, despite my mother's best efforts. Lately, though, I've been interested in it for the potential health benefits, and keeping some locally made pickle-flavor kraut in the fridge. I throw it in sandwiches or just grab a bite here and there. 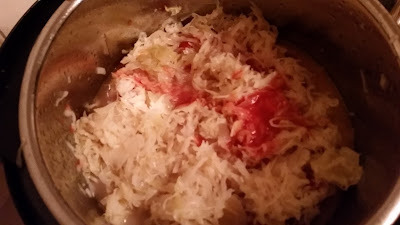 If you're working your way up to liking it, you can drain the kraut for this recipe of its liquid and even rinse it a bit to take the edge off the flavor. 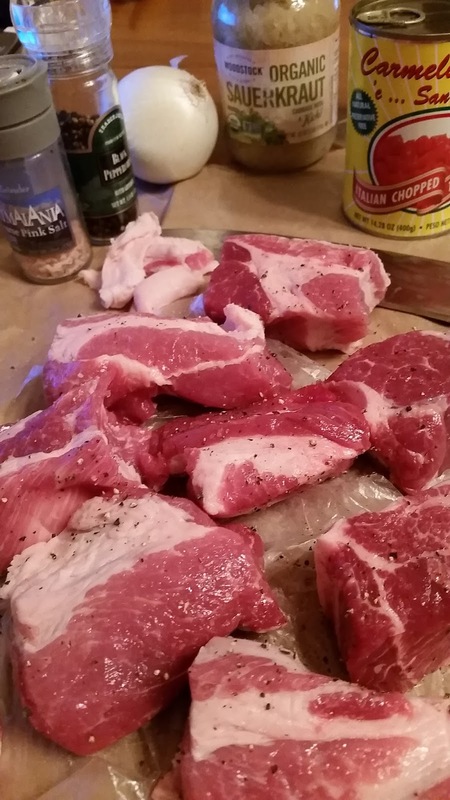 Trim the ribs of some excess fat, then cut into even sized pieces and season with salt and pepper. Plug in the Instant Pot and, leaving the lid off, press the saute button. Put the olive oil in the insert to heat up. I put a piece of the extra fat in the pot as it heated up so I could hear the sizzle when it was hot enough for browning. Put half the meat into the pot and let brown, about 3-6 min each side. Remove to a plate or bowl and repeat with the rest of the meat. When you're browning meat, if you try to pick it up and it's stuck, that means it's not ready to turn yet. When it's browned, it will release from the pan easily. 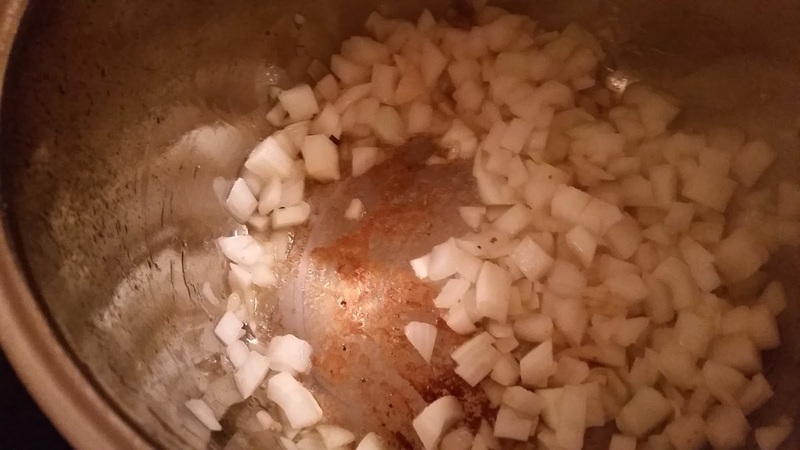 Add the onions to the pot and give them a good stir with a wooden spoon or a metal spatula. Add some of the chicken broth and scrape up the beautiful brown bits left on the bottom of the pot by the pork. 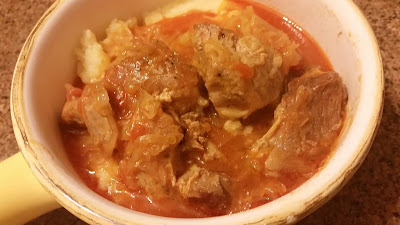 Once the onions are soft and the brown bits are scraped up, add the rest of the ingredients in layers: first the pork and whatever juices it has left on the plate, then the beans, the tomatoes, and finally the sauerkraut. Add in the rest of the chicken broth. Set the pot: press the keep warm/cancel button if the saute function is still going, but it will probably have turned itself off by now thanks to its safety features.lock the lid on and turn the vent to the pressure setting. 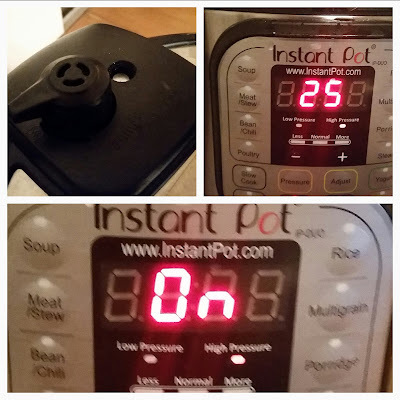 Press manual and use the minus button to set the time to 25 minutes. The pot will say "On" until it has reached full pressure (usually about 10 minutes), then it will start counting down from 25 minutes. When I first got this pot I learned about Quick Release (turning the valve to release the steam right away) and Natural Release (turning off the keep warm function and letting it cool down on its own). Then I discovered a third method, which is to allow the pot to stay on "keep warm" for ten minutes after the 25 are up and then use the quick release valve. Use that third method for this recipe. 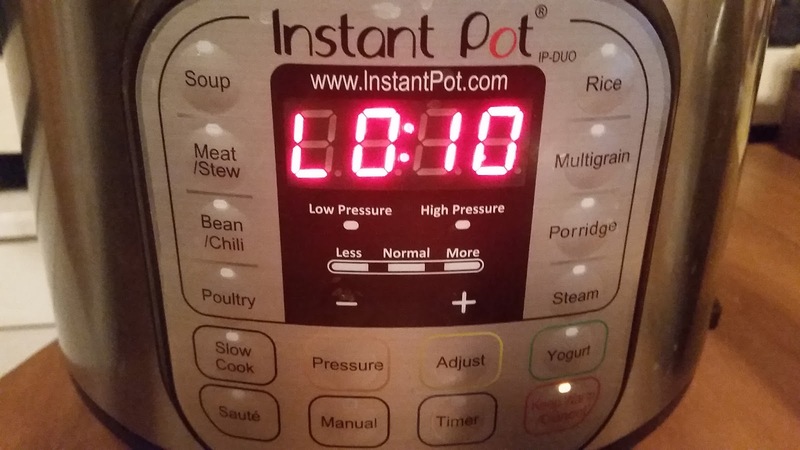 After the beeping that lets you know the time under pressure is up, leave it on keep warm until the display shows ten minutes have passed. Then press keep warm/cancel to turn off the heat and carefully move the release valve to the steam setting, being careful to keep your fingers to the side and not above the valve. Remove the insert from the heating element. Let cool for a few minutes, then serve over veggies or beans if you didn't add them in the cooking process. Top with a little sour cream if you like.